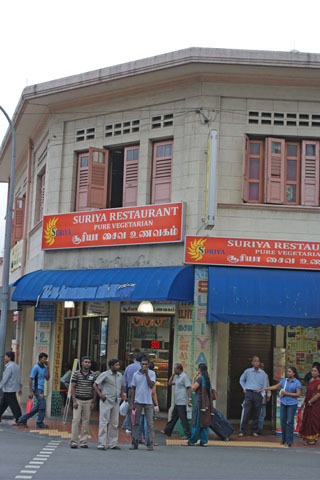 You can trust this vegetarian restaurant opposite the Sri Veeramakaliamman Temple for tasty Indian food at prices even religious pilgrims can afford. Curries and rice dishes are precooked so just take a look (or a sniff) at what's available. For a freshly prepared snack order some roti prata (flatbread) or dosai (savoury pancake) which come with a bowl of dahl curry for dipping and costs less than S$2. If the temple is closed for prayers Suriya is the perfect spot for a cup of masala tea and some people watching while you wait for it to reopen.